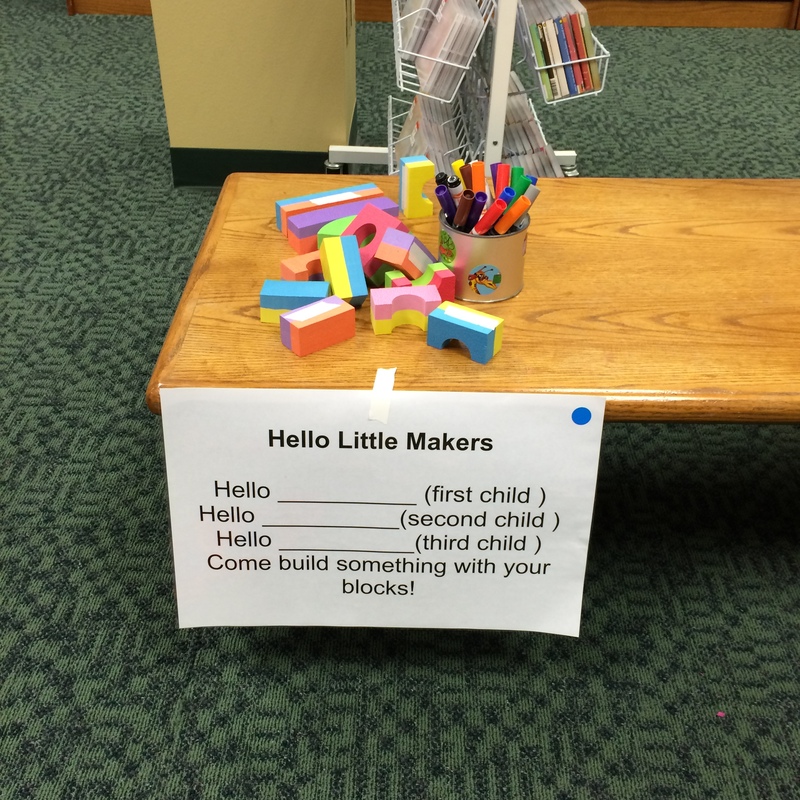 This fall I am starting a new preschool program, Little Makers, once a month on Saturday mornings. All of our preschool-only programs have been during the week, so I wanted another option for parents who work and a chance to explore making and STEAM with the little ones. When I was planning the program, I borrowed a lot of ideas and inspiration from Carissa (seriously, she’s gonna think I’m getting creepy), and other art/stem preschool program rockstars (Kendra, Amy). This month, we did gravity painting, inspired entirely by the awesome Miss Meg! I used this awesome block name tag idea, and had each kid create a name block as they entered. This turned into a lot of pre-program block building! Come build something with your blocks! 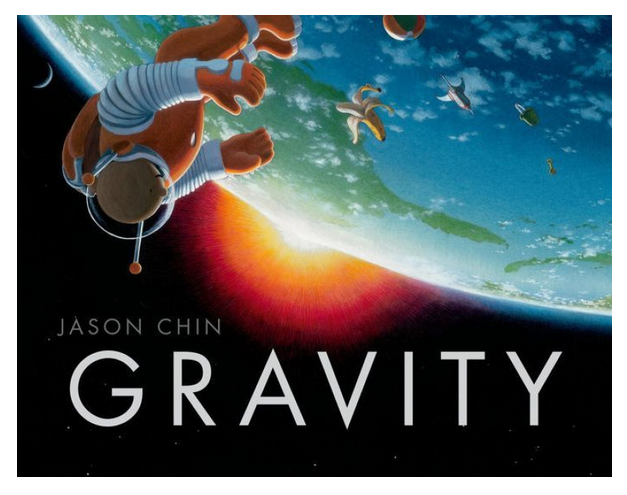 Next up, I read the book Gravity by Jason Chin. I made the kids say the word gravity, and then we talked about it a little. 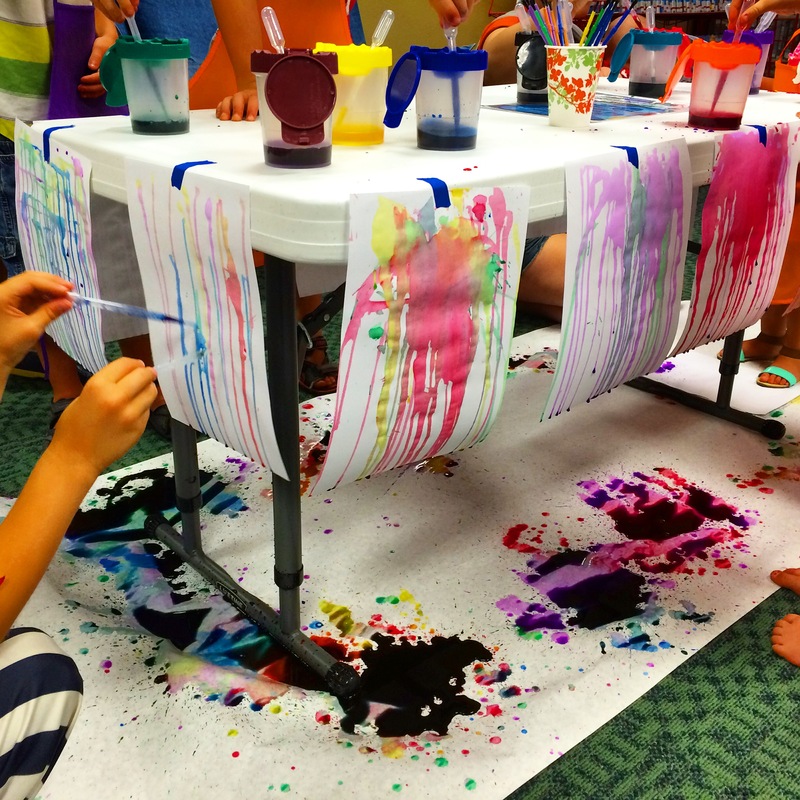 After the story, I explained our project: gravity painting using pipettes to drip water onto paper taped to the edge of a kid-sized table. 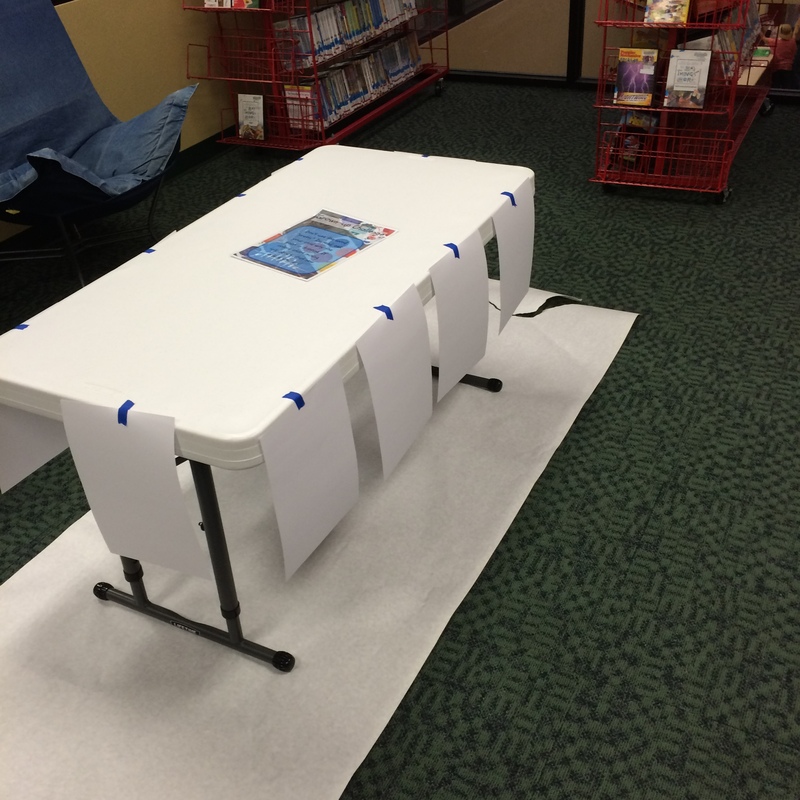 At the last minute before the program, I put down a huge piece of butcher paper under the table, and its a good thing I did! I hadn’t really considered all of the paint that would drip onto the floor… We used liquid watercolor for the paint, which I diluted heavily, and it worked great! I had a pack of 100 pipettes, and although I also put out a few brushes just in case, I explained to the grown-ups that the pinching motion was great for kids to practice and encouraged them to stick to the pipettes. I also sent the families home with a few pipettes to keep practicing and trying. 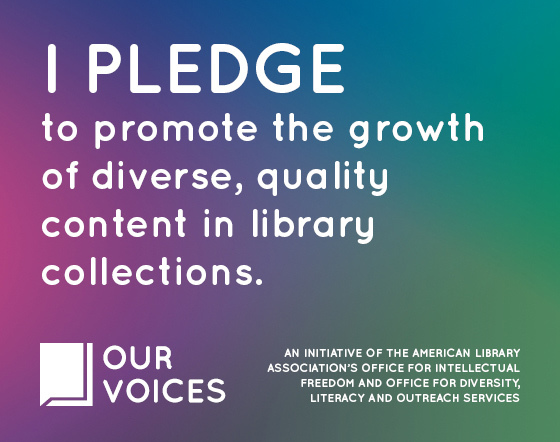 The other big and new part of this program was a grown up challenge. 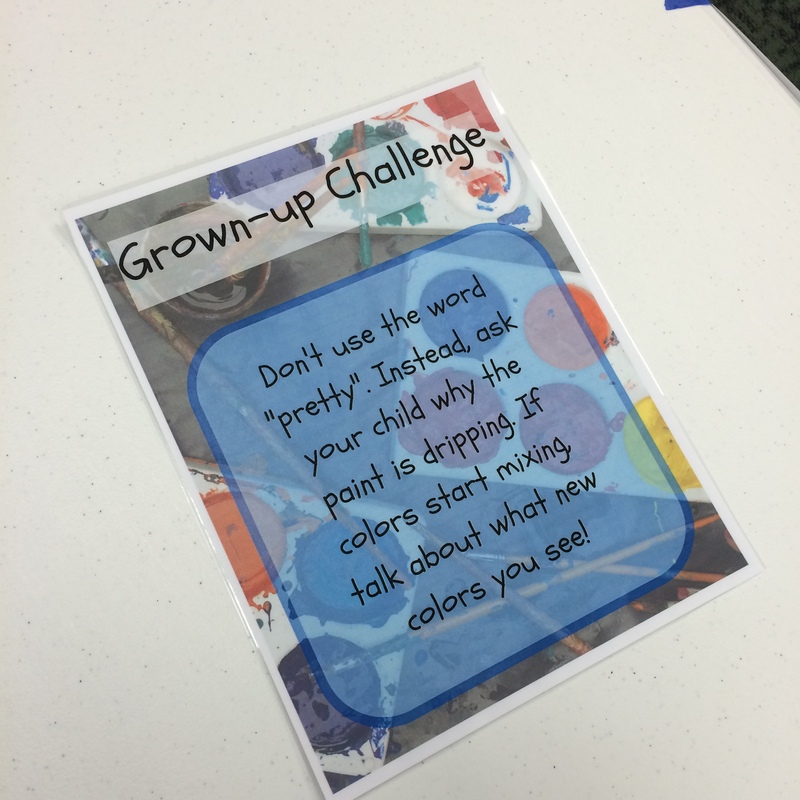 This month, our challenge was to avoid the word “pretty,” (I HATE THAT WORD WITH KIDS) and instead talk about gravity, colors, and what/why the paint is doing. At one point, I heard a mom say, “That’s really pretty. Oh! I’m not supposed to say that… I like the colors you chose!” It was awesome. 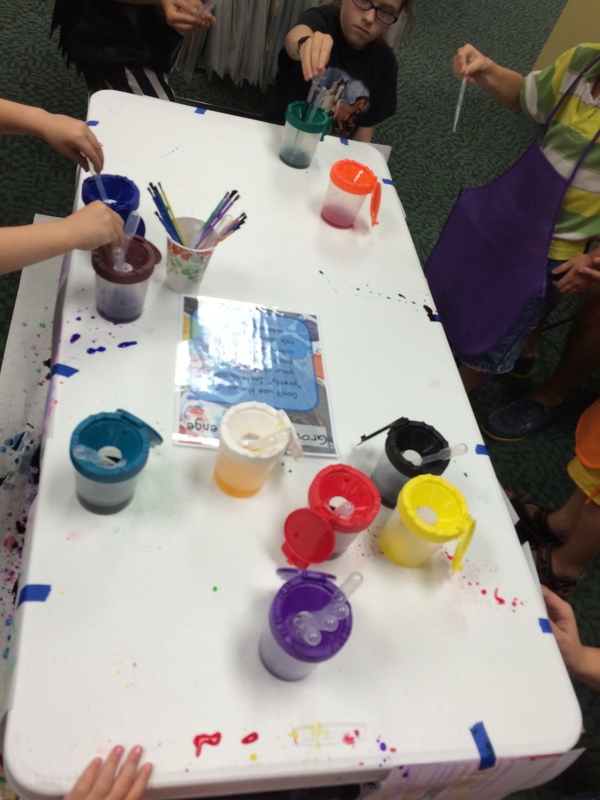 There was a lot of talk about dripping, lines, color mixing, and lots of gravity. Some kids did multiple paintings, and they all took them home. This program was a big success and lots of fun! I can’t wait for the next one! Love this! Where did you get those droppers? I just ordered them from Amazon! Hello, was this done with food coloring or paints?? We used diluted liquid watercolor paints.